Exclusive: The United States supported the secret supply of weapons to Libyan rebels while Hillary Clinton was Secretary of State according to federal court documents obtained by Fox News. Manners testified before a grand jury investigating American defense contractor Marc Turi who faces trial this September on two counts that he allegedly violated the arms control export act by making false statements. 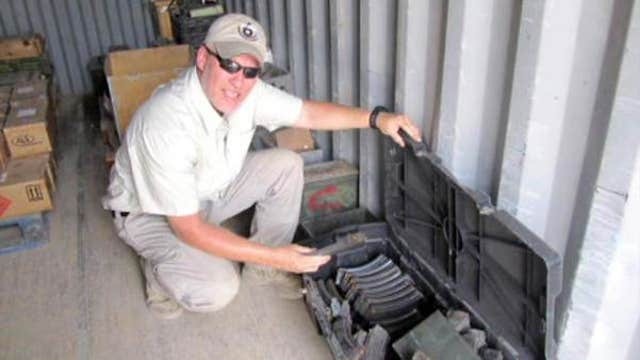 Turi and his company Turi Defense Group are at the center of an ongoing federal investigation over the source and user of weapons defined in court documents as "end user" or "end use" flowing into Libya as Moammar Qaddafi&apos;s regime was collapsing in 2011. "It was then, and remains now, my opinion that the United States did participate, directly or indirectly, in the supply of weapons to the Libyan Transitional National Council." In "United States of America v. Marc Turi and Turi Defense Group," Manners identifies himself as having 18 years experience as an intelligence officer with the Central Intelligence Agency or CIA, with foreign postings as Chief of Station in Prague, Czechoslovakia and in Amman, Jordan. Manners also stated he was “the executive assistant to the Deputy Director of the National Security Agency." Manners’ declaration supports statements made exclusively to FOX News by Turi about what President Obama&apos;s team and members of Congress knew about weapons flowing into the region during the chaotic Arab Spring of 2011. "When this equipment landed in Libya, half went one way, and the half went the other way," Turi said, emphasizing that poor oversight, allowed individuals hostile to the United States to get arms. "The half that went the other way is the half that ended up in Syria." As part of Fox&apos;s ongoing investigation of the 2012 terrorist attack that killed Ambassador Chris Stevens, Foreign Service Officer Sean Smith, as well as former Navy Seals Ty Woods and Glen Doherty, Turi spoke exclusively to FOX Senior Executive Producer Pamela Browne. The investigation premiered on "FOX Files" on the FOX BUSINESS NETWORK. Turi was one of several thousand US arms contractors licensed by the State Department to sell and move weapons around the world. He&apos;s been a go to guy for the US government, most recently in Iraq and Afghanistan. "I got involved in this business in the 1990s," Turi explained. "I&apos;ve been involved in all type of operations, regarding transportation, logistics, and liaising with those foreign governments." Turi admits to a criminal history. He told Fox that in the late 1980&apos;s, he stole a computer, his roommate&apos;s car, and wrote bad checks including one for $100,000 dollars. Through court records, Fox News verified he was arrested, convicted, and served time in an Arizona jail. Licensed arms contractors require painstaking compliance in order to obtain the necessary approvals set by strict US government regulations. While Hillary Clinton served as President Obama&apos;s Secretary of State, American arms dealers were awarded a record number of export licenses to sell sophisticated weapons, military parts and technology internationally. "That&apos;s actually been a huge, policy position, of the Obama Administration," Celina Realuyo, a professor of national security at the Perry Center at the National Defense University explained to FOX. Realuyo has served two presidents with expertise in tracking down money and weaponry used in what are called "dark networks" that can channel weapons to criminal and designated foreign terrorist organizations. More than 86-thousand licenses with a value of $44.3 billion dollars were granted in 2011... a surge of more than $10 billion dollars from the previous year. In the spring of 2011, Turi says his high level contacts both inside and outside of the US government, encouraged him to explore options to arm the Libyan opposition as they tried to overthrow then Libyan dictator Moammar Qaddafi. He says his associates included David Manners, a former intelligence officer with the CIA who stated his expertise to the court as an expert with knowledge of "authorized covert arms transfers." Turi provided documents and email exchanges with high level members of Congress as well as military, and State Department employees which are currently being reviewed by Fox News. "The half that went the other way is the half that ended up in Syria." Turi said, "That&apos;s where I came up with this "zero footprint" Arab supply chain whereby, our foreign ally supplies another, Arab country." In this case, the US would supply conventional weapons to a US ally-Qatar, who would inturn supply them to Libya, as a kind of workaround. "If you want to limit the exposure to the US government, what you simply do is outsource it to your allies," Turi said, describing the practice. "The partners-the Qataris, and the Emiratis did exactly what they were contracted to do." Turi told Fox he never supplied any weapons to Qatar, and it was in the hands of the US government and the State Department&apos;s Bureau of Political and Military Affairs which was headed by a key Clinton aide, Andrew Shapiro. Mr. Shapiro was responsible to oversee the export control process at the State Department. March 2011 was a busy time for Hillary Clinton. Even today, congressional investigators doubt they have all of the emails from her personal server when she was Secretary of State. On the 14th, along with Chris Stevens, who was then the number two man in Libya serving as the embassy&apos;s Deputy Chief of Mission, Clinton met with Libya&apos;s Mustafa Jibril in Paris-- a senior member of the TNC. The next day, Secretary Clinton met with Egypt&apos;s new foreign minister Nabil el Arabi in Cairo and walked through Tahrir Square with her senior adviser Huma Abedin. At the same time, Turi&apos;s proposal, a 267-million dollar contract, was working its way through US government channels. "My application was submitted on the 12th," Turi said his contacts gave the proposal to the then Secretary of State. "...through their relationship with the TNC, then provided that application information to Mrs. Clinton via the TNC council when she was in Cairo. That&apos;s what was told to me...and emailed. " Stevens replied with a "thank you " and wrote "I&apos;ll keep it in mind and share it with my colleagues in Washington." In May 2011, Turi got a brokering approval from the State Department for Qatar. In July, his Arizona home was raided by federal agents. "They came in the full body armor, and weapons and, they take my computers and my cell phones and that was it. That was the last time I saw them. And they&apos;ve been chasing me all over the world for the past three years, speaking to associates of mine all over the United States and looking into my records and my past." His attorney Jean-Jacques Cabou told Fox in a series of emails that his client had a track record working for the "US government through the Central Intelligence Agency" and the government case is an “epic fishing expedition." Adding his client"...neither lied on any application nor did he do anything other than support U.S. foreign policy and interests in the Middle East." Turi believes his "zero footprint" idea was stolen out from under him, and now he is being blamed for a program that went off the rails. Such are the stakes in this case, that the Justice Department National Security Division is involved, and recently requested that some proceedings remain secret under CIPA, the Classified Information Procedures Act. The Federal Judge wrote on June 16 "the government can seek protection under CIPA 4 in this case only by complying with Ninth Circuit law by making a formal claim of privilege, lodged by the head of the department which has actual control over the discoverable information." In his sworn declaration to the court, Manners said his grand jury testimony on covert arms transfers was cut off by the government lawyer. "As a result of the Assistant United States Attorney&apos;s actions, I believe that (a) the grand jury never received a full and complete picture of authorized covert arms transfers and their relevance to the present case. " "At some point, I may be that internet video excuse," Turi said, referring to statements where then Secretary of Clinton and members of the Obama Administration wrongly blamed an obscure anti-Islam video for the 2012 terrorist attack that killed four Americans. "I don&apos;t know. But, it&apos;s really strange that the US government would invest three years, a multi-year investigation, fly all over the world interviewing people, for an application." "I will see what information is available," then Secretary Clinton ‎responded. "I don&apos;t have any information on that."